The firm has received five reports of the snaps detaching from the garments. No injuries have been reported. 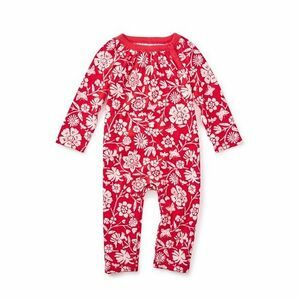 This recall involves two styles of children’s rompers sold in sizes 0-3 months and 18-24 months. They are Vermillion Painted OPP Floral Romper with style number 7F32500, and the Shocking Fuchsia Rose Romper with style number 7F32504. The Vermillion rompers are red with white floral print, and the Shocking Fuchsia are maroon with a pink floral print. The style number is printed on a tag sewn on the inside of the garment located in the waist area. Nordstrom, Von Maur and various boutique stores nationwide and online at teacollection.com from July 2017 through December 2017 for about $27. Consumers should immediately take the recalled rompers away from children and contact Tea Living for a full refund.